Southern insurgents or anti-junta forces behind Thai blasts? 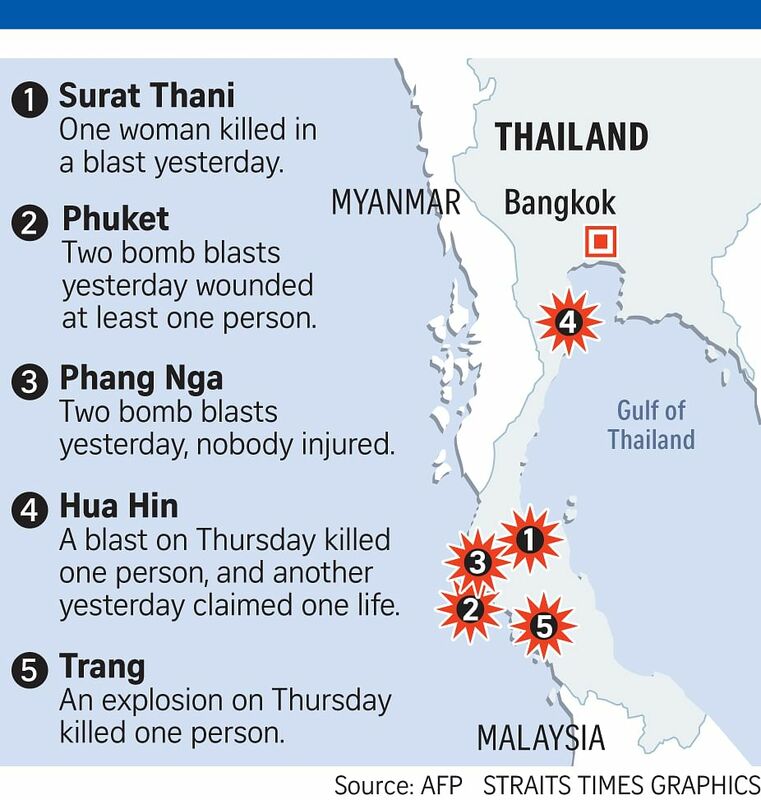 Though no one has claimed responsibility for the wave of bombings in the past two days in southern Thailand, police chief Chakthip Chaijinda said the bombs found were similar to those used by separatist militants in the country's restive southern border districts. The bombs that went off in Phuket, Phang Nga, Surat Thani, Prachuap Khiri Khan and Trang provinces were hidden in public places and detonated by mobile phones. At the same time, firebombs were used in arson attacks in Krabi and Nakhon Si Thammarat provinces. But General Chakthip said it was too early to draw a clear conclusion. Security analyst Anthony Davis of IHS Jane's was convinced of a southern separatist link. Separatist militants have long fought a shadowy war with the Thai military in the Malay Muslim-dominated provinces of Pattani, Yala and Narathiwat, as well as a part of Songkhla. The insurgency has claimed more than 6,000 lives. While the conflict has largely been confined to the "deep south", as this region is known, there have been signs that the insurgents are reaching beyond those borders. Last year, seven people were injured when a car bomb went off in the basement of Central Festival mall on Samui Island, a tourism haven. Fires were reportedly started at the same time as the explosion. Two years before that, police on the resort island of Phuket found and defused an improvised explosive device - two cooking gas tanks hooked up to a timer - in a pick-up truck. Thailand held a referendum on Sunday on a draft Constitution that institutionalises military oversight over the future elected government, by giving the ruling junta the power to pick almost all members of a more powerful Senate. The draft charter was endorsed by 61.35 per cent of valid voters nationwide - but rejected in Pattani, Yala and Narathiwat. The period leading up to the plebiscite was marked by an upsurge of insurgent bomb attacks. The latest attacks beyond the deep south "reflect the fact that they are raising the level and extending the scope of the conflict, possibly with a view to establish a strong bargaining position", said Mr Davis. "The target here is Thailand's tourism economy. It is taking place in the run-up to the tourist high season," he added. Chulalongkorn University political analyst Thitinan Pongsudhirak, however, thinks the insurgents are unlikely to be behind the attacks. "If they had wanted to send a message to the junta, the insurgents would more likely have attacked Bangkok, or major cities such as Chiang Mai or Phuket city," he wrote in an article on The Guardian website. "Domestic political unrest, a major source of small-scale bomb blasts over the past decade, since the ousting of the former prime minister Thaksin Shinawatra (in 2006), is therefore the most likely explanation," he added. Since that coup, Thailand has been thrown into political tumult, with demonstrations by both sides of the political conflict "marred by periodic gunshots and small explosions". "The anti-junta forces who lost out in the referendum have an incentive to show bold defiance and lay down a challenge against the regime," he wrote.